3 Healthier Ways To Indulge In Chocolate Chip Cookie Dough! Who doesn’t love cookie dough? We will fess up to having cleaned a spoon or two that was covered in the stuff. It is so sweet, so comforting, and guess what it doesn’t have to be so unhealthy! Today we’ve got 3 recipes to share with you that offer healthier ways to indulge your cookie dough craving. These treats would be great for parties or girls night, or even just good treats for your kids! Chocolate Chip Cookie Dough Greek Yogurt – this glorious recipe comes from The Suburban Girl Gone Country and has been circulating Pinterest boards! We tried it out and it really does taste like cookie dough (different texture but similar taste). We used unsweetened plain soy yogurt and a little stevia in place of Greek yogurt. This would make a great snack for kids, especially if you are trying to get them to enjoy yogurt (and get their calcium)! Vegan Chocolate Chip Cookie Truffles – These truffles from Chef Chloe are less sinful then traditional cookie dough. She omits eggs and uses vegan margarine. But we’d be interested to try using yogurt or apple sauce for part of the margarine to cut back on fat. The best part about this recipe… you can control your portions by just having one (OK maybe two) truffle(s) at a time. 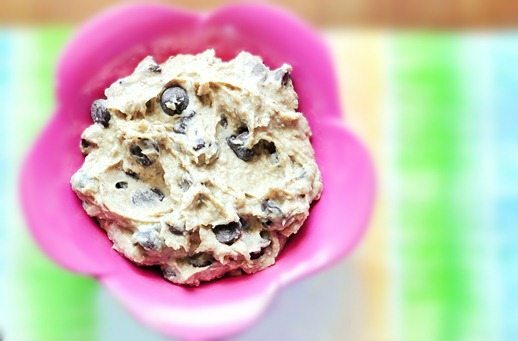 Healthy Cookie Dough Dip – You won’t believe the secret ingredient in this dip… and neither will your friends. This dip is gluten free, high in protein, and can easily be made sugar free & vegan! Make up a batch and indulge mostly guilt free… we promise you won’t regret it! Are you a cookie dough fanatic? If so let us know what you think of these recipes!